According to the stamps in my passports, Ethiopia is actually the first country I ever visited in Africa. 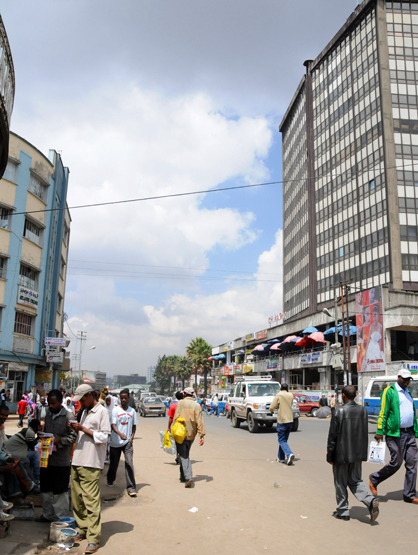 After I missed my connection to Nairobi due to some extreme flight delays, I had an unplanned stay in Addis Ababa for a single night back in 1999. Of course I don’t count this experience as a visit since I didn’t do anything more than ride from the airport to the hotel and back. But I do remember looking out the window of my bus at the city and all its people going about their daily business. 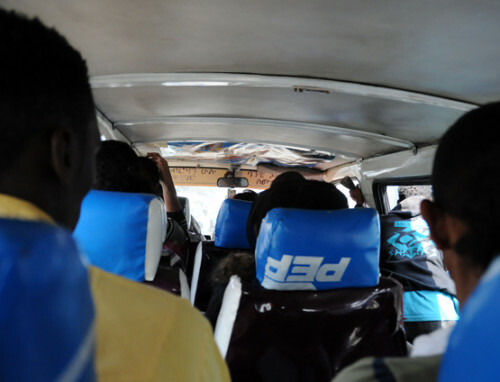 I felt teased by riding through the Addis Ababa and watching a country through a bus window without the possibility of getting out and experiencing anything. 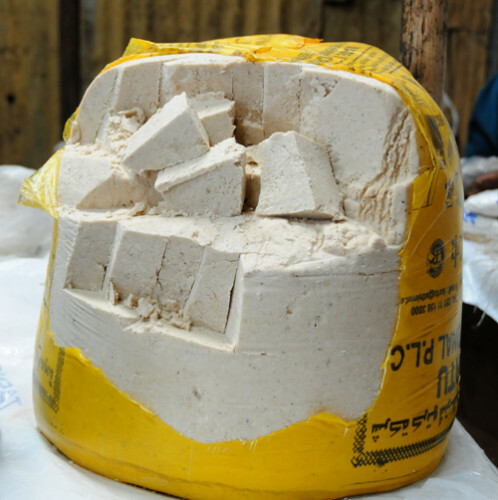 Fortunately with a little bit of patience, about 10 years later I finally returned to Ethiopia and was able to satisfy my decade old curiosity. 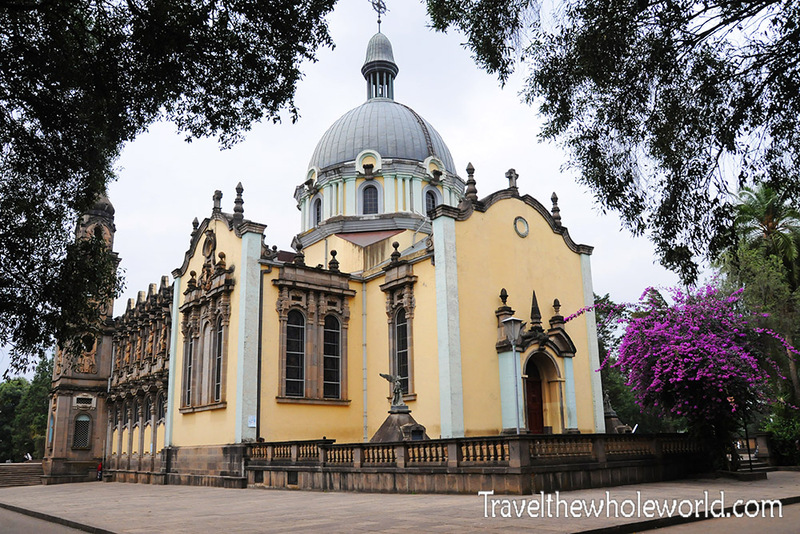 Since it’s no longer allowed to take photos of all the government buildings in Ethiopia, which includes the Imperial Palace, I figured the next best place to start in Addis Ababa photography wise was the Trinity Cathedral. 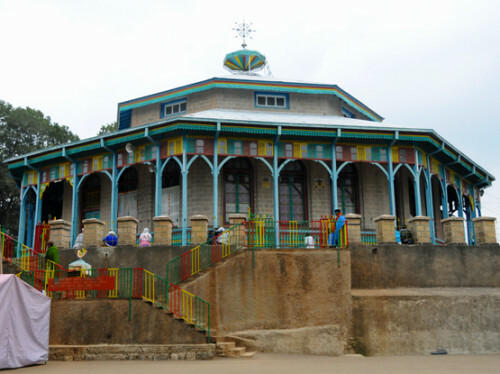 The church was built after World War II, partially to celebrate Ethiopian’s freedom from the Italian occupation. The Trinity Cathedral quickly became one of Ethiopia’s most famous and important churches and so it has the honor of being first place on my web page. 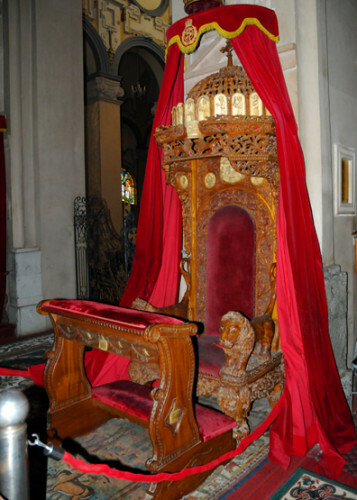 For nearly 35 years Emperor Haile Selassie ruled Ethiopia and worshiped at the Trinity Church. 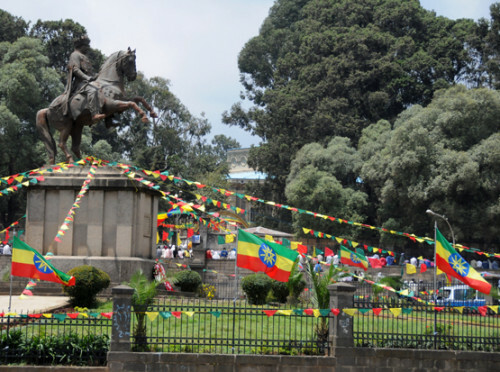 I always hear Ethiopian’s talk about Emperor Selassie both on this trip and when I talk to Ethiopians back home in the United States. The way I hear most people talk about him it almost seems like he passed away only a few years ago, but in fact he lived from 1892 and was killed in 1975. The story regarding his alleged murder is written about further below, so for now just know that he is buried in the Trinity Church along with his Empress Menen Asfaw. 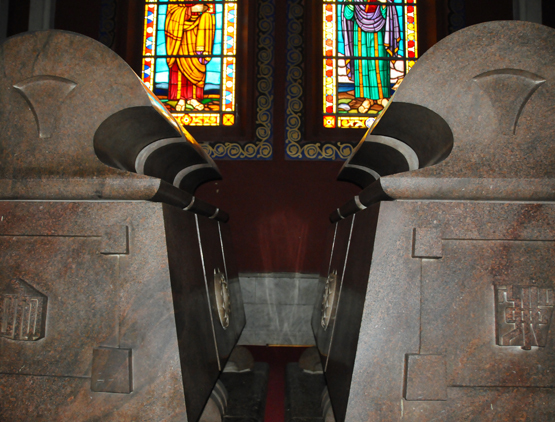 Above are their tombs on the upper left and his throne on the right. 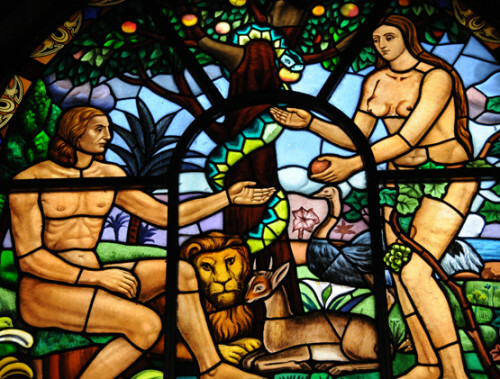 The photos below of the stained glass and the cemetery are also part of Trinity Church complex. 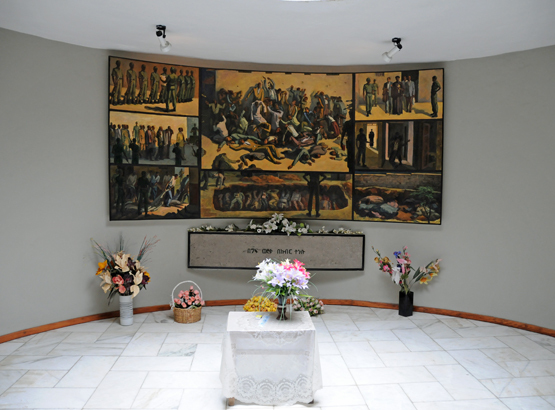 The church complex has several buildings including a small museum with some artifacts and traditional clothing over the past few centuries, including items that once belonged to the Emperor. I was unable to sneak any photos here from the museum, and when I asked the guard if I could take some anyway he politely told me no. Above is the only photo of a government building I was able to take. 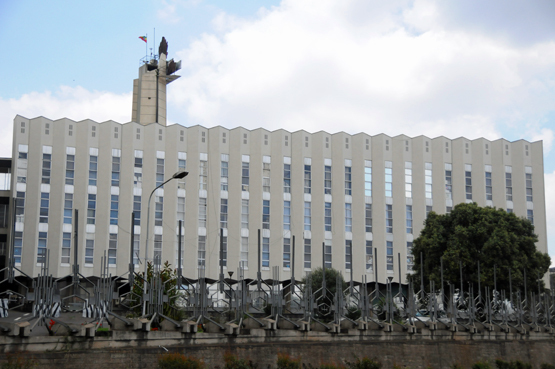 This is the home of Ethiopia’s government and functions like most country’s parliament buildings. I drove past the palace several times and considered taking a photo but as there were armed guards I figured it was probably a bad idea. 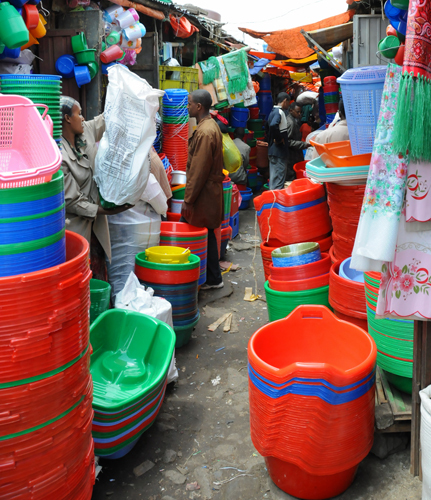 A famous place to visit in Addis Ababa where you can take all the photos you want is the piazza, Italian for plaza. This place seemed to be a legend as far as things to do in Addis Ababa go. 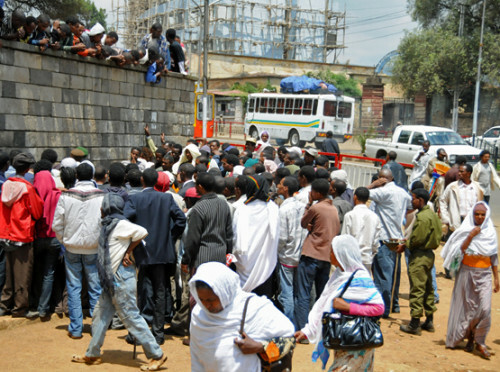 I imagined it to be Ethiopia’s Time Square, or their version of China’s Tiananmen Square. I had studied a map online on how to get from my guest house to the piazza and set out for a quick 15 minute walk curious about what wonders I might find there. I sadly discovered the piazza by asking someone for directions, and having that person explain I was standing in it. Quite disappointing, it actually didn’t look much different to me than other parts of the city, I felt more like it was simply a place where busy roads intersected more than anything else. Perhaps I was missing something, but as the airline office was here and this turned out to be a good place to find a taxi or a local guide for the day, I came and went to the piazza almost daily and it never impressed me. 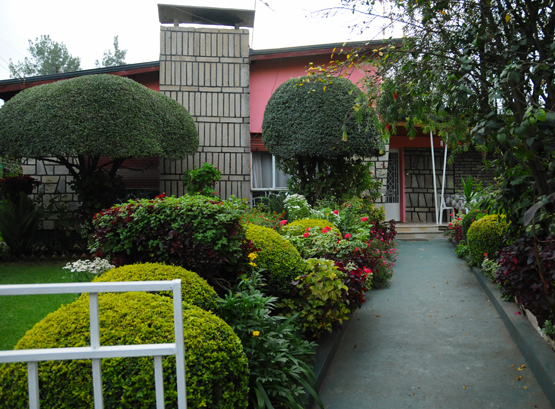 When I was visiting Addis Ababa, I stayed at this nice guest house that was somewhat close to the piazza. The street itself that the guest house was located on was pretty shabby looking as it was simply a muddy road lined with poor houses and poor shops seen above. Once inside the front gate though, you can see below that it’s a nice place to visit and the prices were reasonable. I actually left a macro lens here and didn’t realize it until I had left the country. Not only did the owner find it but he had it immediately mailed to me back home in the United States! I stayed here most of the time in Addis Ababa and enjoyed the people and the location. Of course there are plenty of upper class and more traditional hotels to stay at, and I even spent a single night at the Beer Garden which has its own brewery. Mostly European travelers and businessmen seemed to be at the Beer Garden while the guest house had people visiting the country for all sorts of reasons, including a German couple who had just adopted a son here. The two cats where also at the guest house and seem to be permanent residents here. 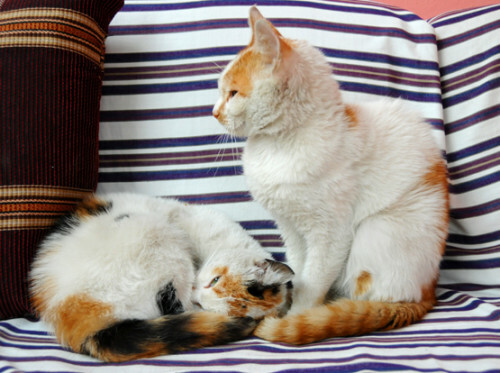 Of course the guest house was mostly for sleeping and planning, I didn’t spend much time there and was usually out roaming the city. 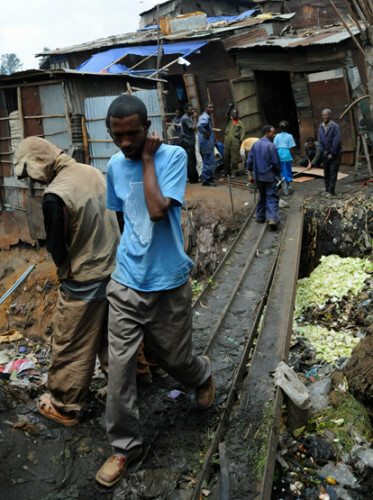 I came across these places above while on some random streets in Addis Ababa. 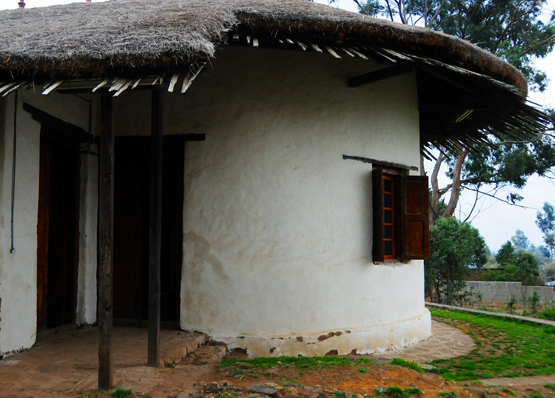 A traditionally built structure on the left and a modern high rise on the right. 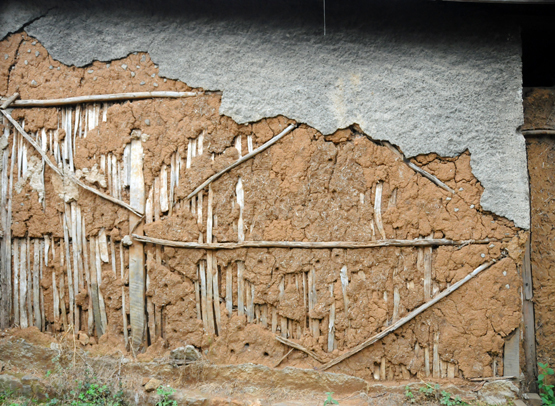 The mud has been breaking away exposing the technique used to hold the structure walls together. What caught my eye for the building on the right was the fact that those scaffoldings are handmade out of nothing but wood and rope! 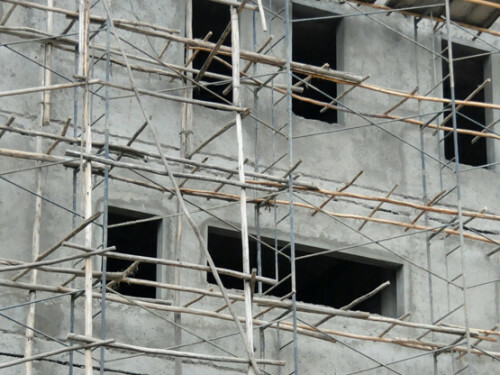 Imagine trying that in the United States and getting caught by OSHA. I suppose the people who set this up are experienced and it’s relatively safe, but it certainly looks intimidating to climb. My first unintentional visit to Ethiopia in 1999 was due to the most horrible delays and flight experiences I have so far endured to this day. I was smart enough to not book my United States flight to Addis Ababa with Ethiopian Airlines who were the cause of my previous misadventures, but I did use them for a flight to neighboring Djibouti. They were nice enough to call my guest house and tell me that my flight was canceled and I should visit their office for new details. I later walked to the piazza only to find the whole neighborhood powered off and the airline office explaining to me they couldn’t check their my flight status or call another office because both power and their phones were down. The next day I found out that my missed flight had never been canceled but only delayed, no real surprise there… Anyway, point is I was fortunate enough to have my flight cancellation take place on March 2nd. 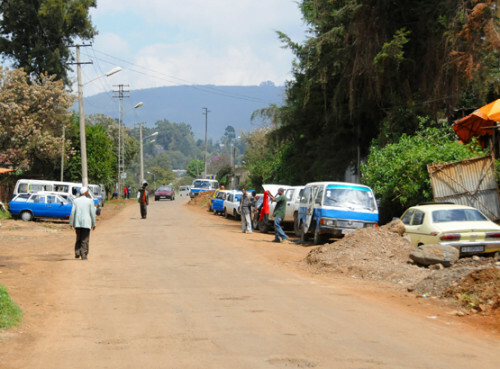 At first I was pretty pissed off, but since I was going to be spending another day in Addis Ababa I decided to once again aimlessly roam the city like I normally do. 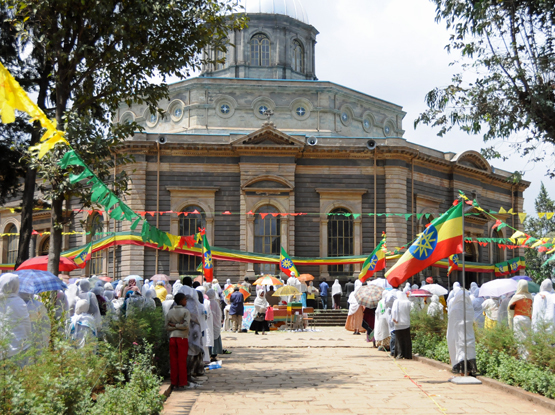 I found that many squares and churches were decorated with Ethiopian flags and tons of people were out walking around. A few street corners had some Christian preachers giving speeches to small crowds, and other places had much larger ceremonies and celebrations taking place. After struggling to find a local who spoke English, I came to understand that March 2nd is a holiday similar to independence day. I say similar because Ethiopia was never colonized by Europeans, but in the late 1800’s the Italians did try and invaded the country. The battle of Adwa occurred on March 1st 1896, and the decisive victory by Ethiopia kept the country independent. 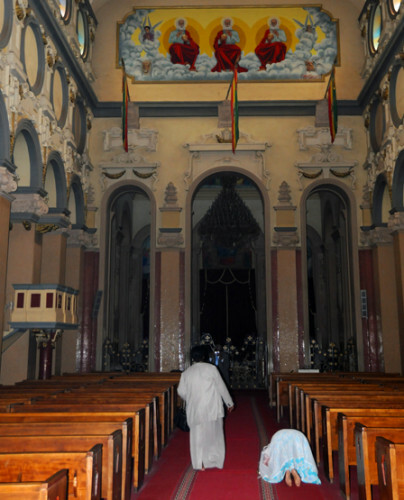 Above is a photo of St. George’s church where a Christian ceremony was taking place. Below is a photo taken outside the church where a preacher has a large crowd in front of him. 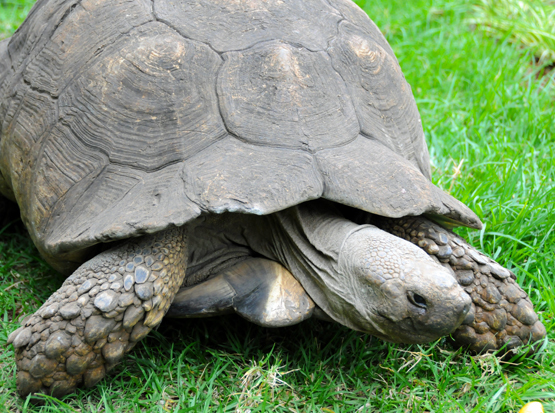 As for the tortoise… I can offer no logical explanation. There were several of them roaming the church grounds here but no where else in Addis Ababa. 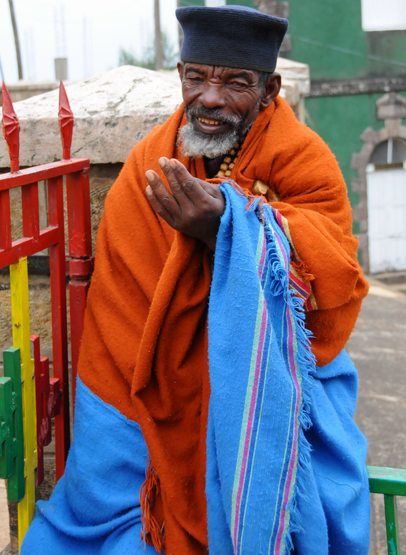 What I loved about traveling in Ethiopia was the traditional clothing and religious people I’d meet. I felt these men above in traditional clothing probably haven’t changed much as far as their beliefs and clothing go over the past few centuries. The staff the man is carrying on the left was pretty common with older males and from what I understand it bears some spiritual power. 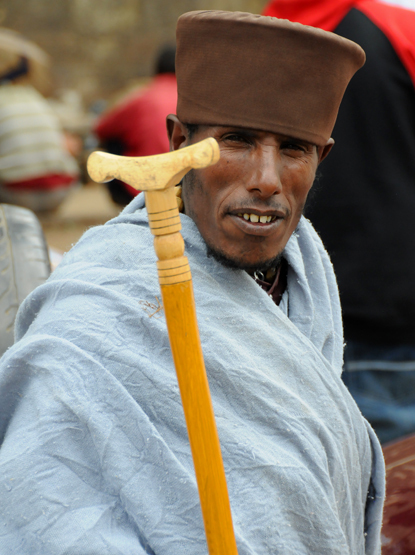 Ethiopia is mostly Christian, but has a very large Muslim population and one of the largest populations of Jews in Africa. Ethiopia has had an unfortunate past when it comes to its previous rulers, one of the worst being the Soviet backed Marxist dictator Mengistu Haile Mariam. 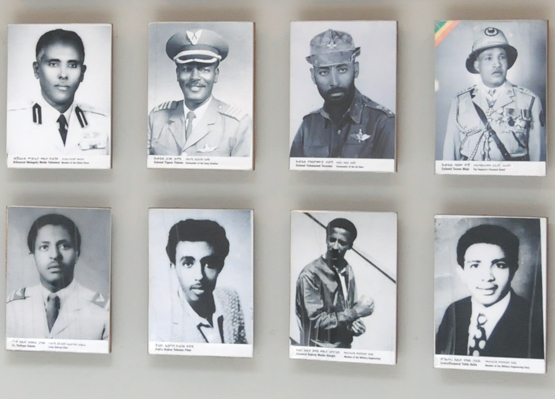 After rising to power in the 1970s, Mengitsu was able to imprison Ethiopia’s emperor Selassie and quickly took power over both the military and the country’s politicians who were members of other parties. His brutal rule and its effects on the population began to be known as the Red Terror, and one of the worst tragedies that occurred was when he systematically killed his political opponents. This was known as the Derg massacre and this occurrence was just one of many actions Mengitsu did that lead to his genocide charges in 2007. 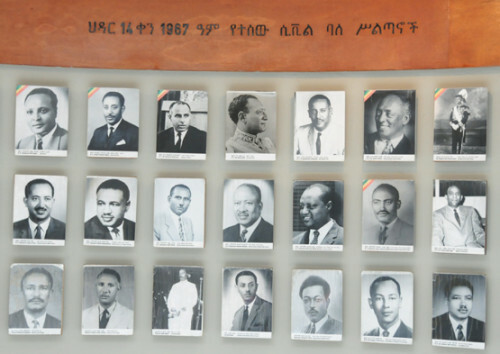 The Derg massacre killed 58 opponents within his own party that included several high ranking officials and some of Ethiopia’s brightest and most educated people. 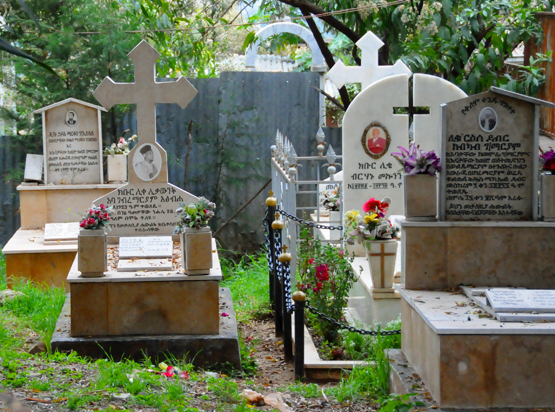 The Derg massacre resulted in the deaths of two former prime ministers and several top military leaders. They were buried in a mass grave which is now a memorial seen on the left. Below are photos of some of those who lost their lives that day. Moving on to less depressing things, a good place to relax and enjoy yourself in Ethiopia is one of their traditional coffee houses. 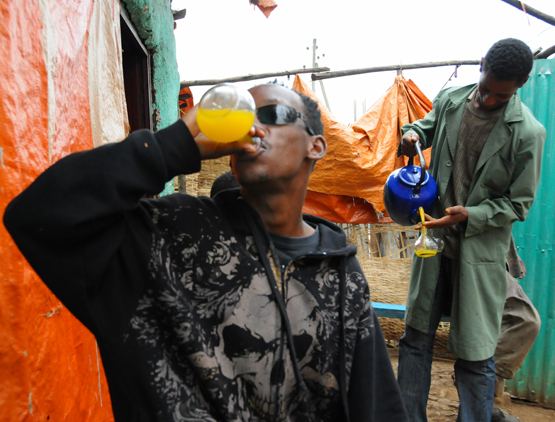 Two traditional drinks I tried in Ethiopia was Tej and of course their coffee. On the left, some guy I met on the street was the one who took me to try Tej; an alcoholic drink made out of honey. It had a unique taste and was fairly strong so I asked him what the alcohol content was. He explained that it was different each time, which I would imagine could make having a few drinks kind of dangerous. 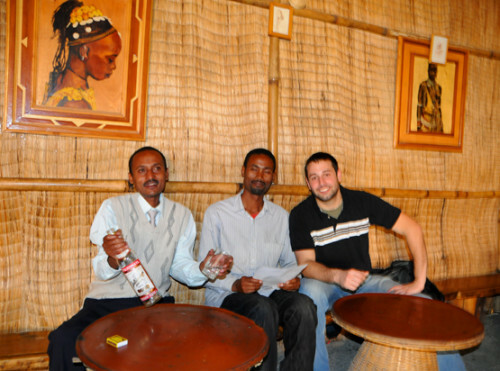 On the right is myself trying Ethiopian coffee in a traditional coffee house. Many people in the coffee house also smoke and there is a small bar available as well for those who want to grab a beer or drink liquor. 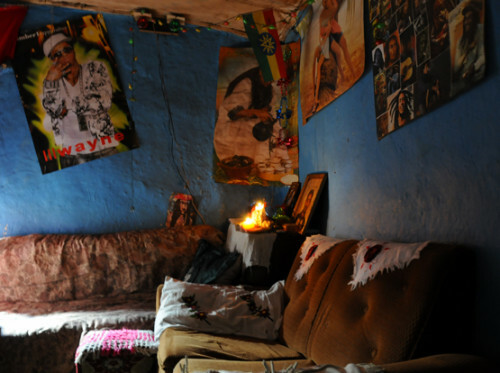 Another tradition to try in Ethiopia is a khat bar. 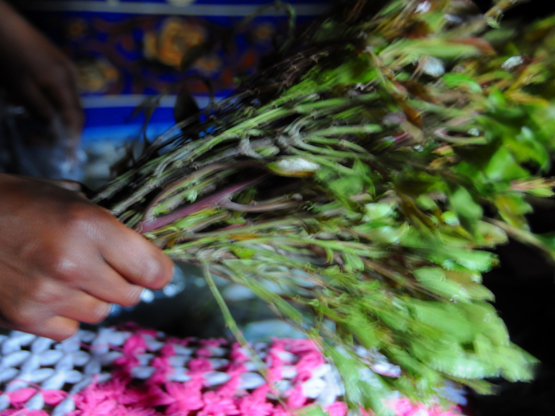 Khat is popular in Ethiopia, Djibouti and Somalia and is a leaf that you chew that gives you energy. I see it as this regions version of South America’s cocoa leaves. 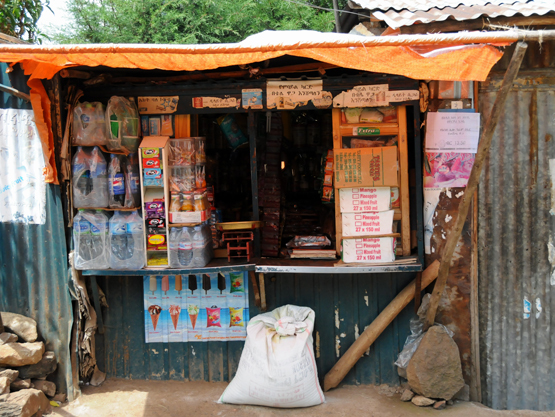 On the right is a khat bar before more people arrived, above is a photo khat itself. It’s extremely popular in parts of east Africa, and khat lounges are probably as common as bars are in the United States or in Europe. The effects are said to be like high doses of caffeine, which is why I imagine it to be similar to South America’s cocoa leaves. 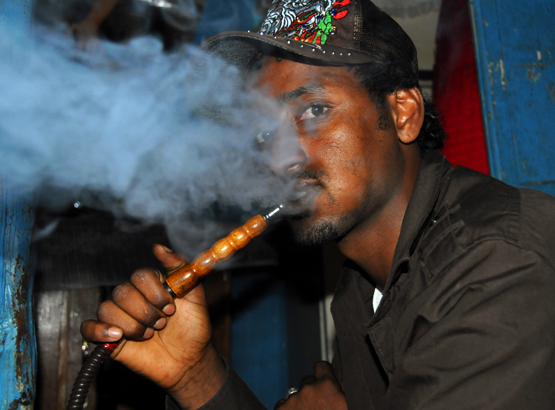 People usually don’t do the khat alone, but also have drinks, shisha or even coffee with it as well. 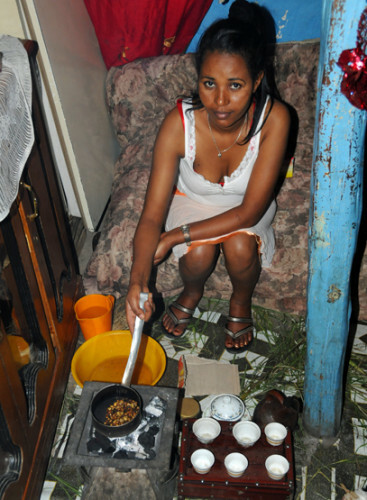 On the right is a guy smoking shisha, the lady on the left is prepares traditional Ethiopian coffee in another lounge. Mashing the coffee beans, boiling water at 7,000 feet, and other steps she took made this a very long process, taking over an hour. This lounge was small but was nicely decorated and also was playing reggae music so it had a relaxing atmosphere and was a nice experience. Addis Ababa has one of the most efficient public transportation systems I’ve ever used. If you walk down any main road you’ll be passed by a mini bus every minute or so. Unlike regular city buses, these don’t have any confusing routes or schedules to follow, they simply go up and down the same street. 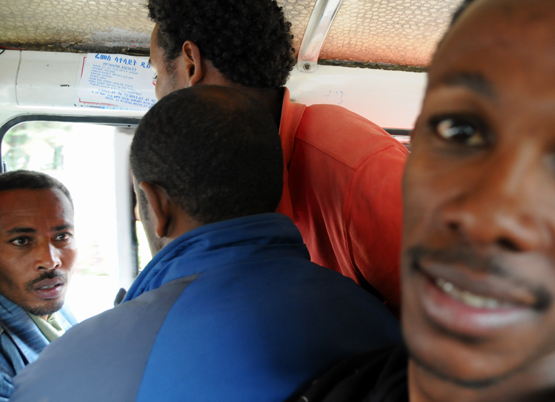 You can jump on and pay 1 birr which was less than an American dime at the time of my visit and jump off whenever you’d like to. These actually don’t run the full length on some of the longer busier streets, so sometimes they’ll stop to make a U-turn in which case you can just pay another birr and get a new minibus to continue on. 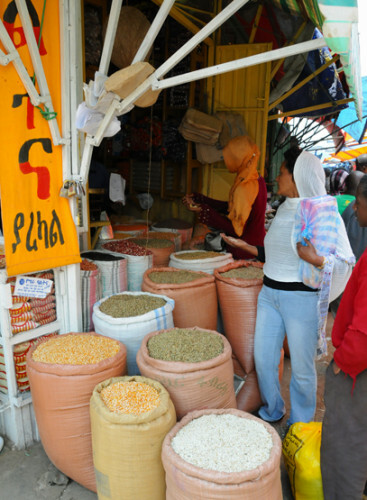 One of Addis Ababa’s most interesting places to visit is it’s Mercato, Italian for market, unlike the piazza, this place met my expectations. Covering several square kilometers, it is considered to be all of Africa’s largest open air market and sells everything from live stock, to electronics and food. If I put one picture for every business that operated in the mercato on this web page, then I’d have 7,100 pictures! To further put things into perspective, the mercato employs about 13,000 people. A lot of animal products are sold in the mercato as well, I even saw cow feces for sale that can be used to burn as fuel. That might sound strange at first, but I know Americans did the same in the wild west and called them buffalo chips. The chickens on the above are being sold along with their eggs that are kept in the back. 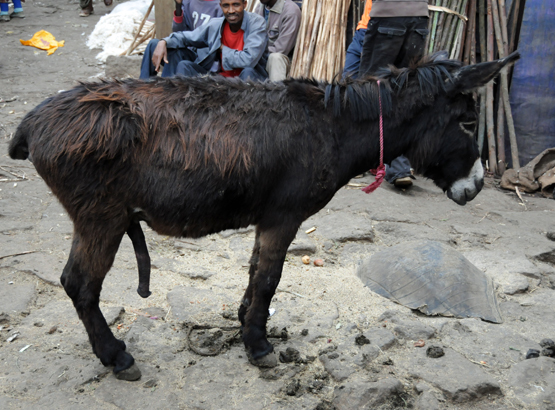 I think someone owns the donkey and uses it just to transport goods rather than it being for sale, but apparently something in the market made the donkey horny. 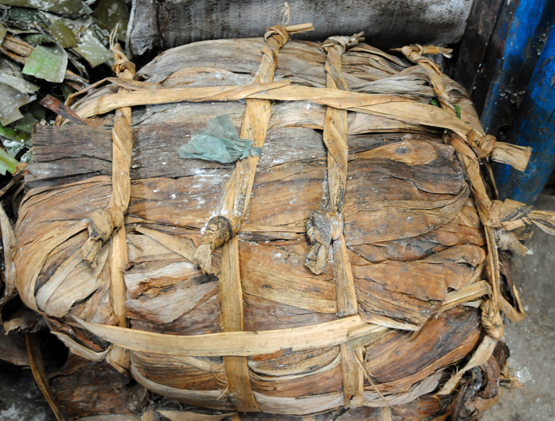 A lot of animal products are sold in the mercato as well, I even saw cow feces for sale that can be used to burn as fuel. That might sound strange at first, but I know Americans did the same in the wild west and called them buffalo chips. 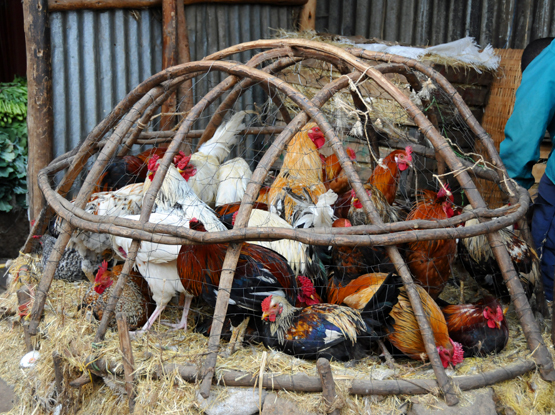 The chickens on the left are being sold along with their eggs that are kept in the back. I think someone owns the donkey and uses it just to transport goods rather than it being for sale, apparently something in the market made the donkey horny.